Our fabulous Coaches Hassel and Reilly! As CPCS has developed, so has the offering of sports and other after school programs. 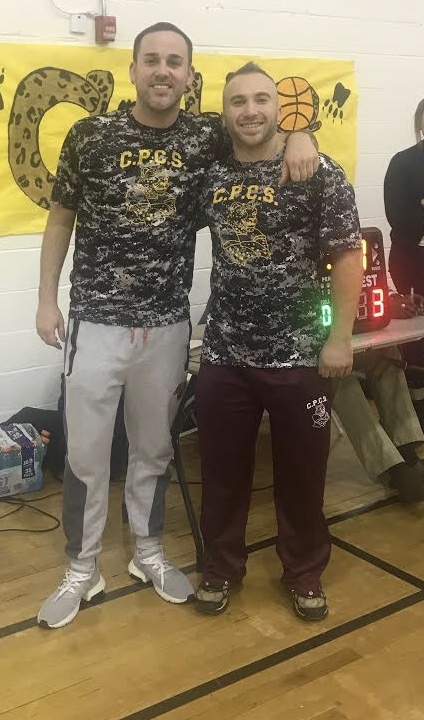 Under the leadership of Coaches Ryan Hassel and Stephen Reilly, our boys’ basketball team has become another reason Cheetah pride is thriving. With an amazing 4-0 record for the Cheetahs so far, the start of their season is a testament to their hard work. As they continue to grow in their skills, the Coaches report that the team is working hard everyday and has improved dramatically since they began playing. During practices, the team works on fundamentals such as dribbling, passing, and shooting. With many of the scholars being new to the game, the coaches are making sure they get the basics down before getting into anything more complex. “We have a great group of boys who challenge themselves and each other to be better everyday,” commented Coach Hassel. Scholar Demetrius Brown leads in scoring, averaging over 8 points per game. There are four more games left in the season, and plans are in the works to host another home game at CPCS. With limited space in our gym, families of the basketball team and cheerleading squad are invited to join these events for now. The next away game for the Cheetahs is on Thursday, January 31st at 5:15 p.m. at Merrick Academy. Please join us there in support of our great basketball team.